Miley Cyrus is an award winning American singer, song writer, and actress. She is a daughter to the famous country music singer Billy Ray Cyrus. Besides her music prowess, Miley Cyrus is also known for a number of roles in movies and television series. And it isn’t something she just started recently, but something she’s been doing since childhood. Some of her hit songs are We Can't Stop, Party in the U.S.A., The Climb, and Fall Down. She has played notable roles in movies such as Hannah Montana, LOL, and High School Musical 2. We have several Miley Cyrus images that capture her singing and acting career. Her images are famous because of her extraordinary talent, physical beauty, and skills. Her career isn’t without awards; she recently bagged the MTV Video Music Award for Video of the Year and World Music Award for World’s Best Female Artist, all coming after several awards in her singing and acting career. Miley Cyrus pictures can give a room a welcoming atmosphere that’s full of greatness, just as exhibited in her life. 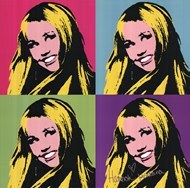 Consider an image like "Hannah Montana - style G;" it’s an image that has its charm and would make an interior livelier. Besides using these images in your own room, you can as well gift a Miley Cyrus poster to her fan. When you look at these pictures of Miley Cyrus, you can definitely see great quality and variety. The variety isn’t limited to the image content alone but also color and size. You can also select the finishing options available for your Miley Cyrus photos. These options are framing, lamination, and canvas printing. Framing gives you more specific choices such as frame color and material. This enables you to get the most fitting appearance. Lamination on the other hand makes the artwork glossier and protected. When it comes to canvas printing, you get adaptability and improved aesthetics. Adaptability makes it possible for you to use the artwork in either traditional or modern interior design inspirations. Be creative with your choices for the best results.